Saint Barthélemy (Saint Bart for short or Saint Barths as it is known in French) is a tiny French island in the Leeward Islands. Located near the island of St. Martin, it attracts the rich and famous to its high-priced real estate and lodgings. Although St. Barth's terrain is more rugged than some islands with its steep-sided mountains, there are about a dozen beautiful beaches for visitors to enjoy. Christopher Columbus discovered the island in 1492, naming it for his brother Bartolomeo, and it was first settled by French colonists in 1648. However, this colony did not survive, and it was not until 1763 that French mariners established a permanent settlement. In 1784, the island came under Swedish rule, as part of a trade pact with France. The Swedes set out to establish the island as a model possession, making the island a free port and naming the capital city Gustavia in honor of their Swedish King, Gustav III. During the next two decades, Saint Barths prospered, and its population swelled to about 6,000 souls. However, a series of natural and economic disasters ensued during the next 70 years, and Sweden sold the island back to France in 1878. By John Mariani, Contributor. Forbes. Monday, 4 Mar 2019 13:26:00 -0500. Kate's extended family - including brother James, sister Pippa and mother Carole - looked to be enjoying every minute of their sun-kissed getaway on the beach on the paradise island. Daily Mail. Monday, 31 Dec 2018 18:55:09 +0000. 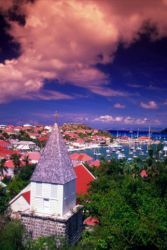 St. Barths first lured celebrities during the 1970s as a Caribbean hideaway. With its French sophistication and upper class atmosphere, the island is a tropical haven. Boulangeries and street cafes, with their wonderful aromas of coffee and baking bread, fill the quaint villages. Luxury villas and small resort hotels offer elegant accommodations and gourmet food. Hire a chef to cook up a feast in the comfort of your own villa, or visit one of the eighty or so restaurants on the island. St. Barths is fairly easy to explore in a day, zipping around the island on a moped or in a Suzuki SUV. Yachts fill the harbor, and visitors regularly come over from St. Martin for day trips. Flying into the airstrip is an adventure, as the planes dive steeply and land, stopping near the sea. For a day away from nature, try shopping in Gustavia at the exclusive boutiques. From Paris fashions and footwear to Ligne St Barth skin-care products, upscale shopping is a popular pastime in this duty free port. Afterwards, enjoy a leisurely lunch or take a break from shopping. Stroll along the quay and ogle the luxurious yachts, go shelling at Shell Beach near Fort Karl, or visit one of the outlying fishing villages.